WE HAVE A HUGE SALE ON STARTING OCTOBER 2017. CLICK HERE TO FIND OUT MORE!!! LIMITED QUANTITIES. The Starkey Muse i2400 hearing aids are the brands top-of-the-line hearing aids which have earned a position on our Best-In-Class hearing aid list. Their high level features and processing capabilities offer good value and comfort features. Read our review below. Hearing Aid Source Review: The Starkey Muse i2400 hearing aid lineup is Starkey’s Top-Of-The-Line model. Starkey Muse hearing aids are available in all styles from a BTE, RIC, and custom made in-the-ear models all the way down to a CIC. The Muse i2400 offers advanced noise reduction features as well as speech enhancing features. It also includes a specialty music recognition function which allows the listener to hear all the nuances of music without any distortion. The Starkey Muse also offers a CROS system which allows a person with single sided hearing loss to hear sounds coming from the unaidable ear in their good ear. As always, when we test hearing aids in our own ears, we set the hearing aid for a 40dB flat hearing loss and we use domes which fully seal our ears so that we can fully assess the sound quality of the hearing aids. 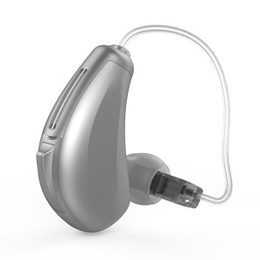 The Starkey wireless hearing aids are wireless programmable and can use the optional Starkey Surflink accessories. New for 2017 – The Starkey Muse RIC hearing aids are now Rechargeable. New Z-Power recharging dock and batteries are an optional accessory to make this hearing aid even more accessible for people. Our initial impression of the Starkey Muse i2400 RIC was pretty good. There was a noticeable, but quiet, hiss of the circuit/microphone noise when the hearing aid is worn, but it was not too annoying. The general fit of the hearing aid is comfortable on the ears as well as in the ear canals. The button on the back is configurable in several different ways for volume, program or tinnitus control. Overall, the Starkey Muse is a quality product and deserves a place in our ‘Best-In-Class’ categories.